Research in my estimation is the most important part of your treasure hunting success. I don’t care how much you spent on your detector or how well you know its functions, if you want to find old and valuable items, you must do your homework and find those areas that contain them. It’s not rocket science! When I first started detecting I had a couple of places in mind but that was it. Fortunately for me there wasn’t a lot of competition and about the only people I saw with metal detectors were those at the beach. As a result I was lucky enough to get my feet wet at local parks, athletic fields, schools, etc. and found silver coins with some regularity. As time went on others entered the pastime and the competition to find older sites begin. That’s when I started researching in earnest. The best part? I enjoyed it. When I wasn’t able to detect (winter time, night-time) I was at the local library, learning all I could about my town, my county and my state’s history. The physical act of doing this made me feel like I was still in the field. I was envisioning the finds that must be present in some of the areas I was reading about. Whether it was an old one room school or a church social in the grove I was making plans, and couldn’t wait to get there to take their treasures. I had pages and pages about places that sounded promising but needed more research. I copied whatever I could at the library, especially old maps. After the reading part I began visually checking out the promising sites by driving the roads in my town, my county and my state. I made notations of those areas that looked like they could be searched without much difficulty and those that I knew needed more work. In other words would I need to find the landowner, write an introductory letter, or knock on doors. Rural, undeveloped sites offered some relief in that most likely the landowner wouldn’t mind my detecting. Other more manicured sites would require a little finesse. I started collecting maps, both old and new, and became extremely interested in topographical maps. Not sure where I first read about them but the information they offered about potential places to detect had me salivating. I could find old schools, churches, cemeteries, mines, and by comparing older topo’s with those of today, I could ascertain where old homesites once stood. Needless to say I purchased as many topo maps of my area as possible. Today I use Google Earth to do a lot of my research. Learn its features, and put them to work for you. Lots of data available and in many instances actually see what the site looks like before you leave your house. Two books I found very useful in the beginning were Advanced Coin Shooting by Patrick Fahey, and Eastern Treasure Hunter, by Dave Redina. Not sure if they are available today but suspect someone, somewhere, has them for sale on the internet. Small booklets but with lots of good material. I would urge any of you who live in big metropolitan areas to get out-of-town when possible and drive the rural back roads. There are a great many areas available for you to detect if you know what to look for. One thing I learned early on was to look for a cluster of trees in what otherwise is an open field. These “might” have enveloped or surrounded a homesite. If you are able to walk the area look for remnants of early life (foundation stones, oyster shells, colored glass, pieces of brick, pottery shards, etc.). If you cannot locate an actual foundation, look for a slight depression in the ground…..an indication that one was present previously. Likewise the trees or shrubs in the depression will typically be shorter than those surrounding it. Also remember to look for any vegetation that is not native to the surrounding area. That would indicate someone probably planted it there…..another validation of prior habitation. You might also look for an overgrown lane or road that seemingly goes nowhere. Sometimes they can lead to an old homesite. Look for road name clues. Keywords like grove, school, grange, park, lake, church and reunion. Roads years ago were typically named after their predominant use or purpose. When driving through small communities look for schools, churches, athletic fields, town squares, parks and empty lots. If you stop at a school or church try to locate the cornerstone to get an idea of how old they are. If you have the time stop at what appears to be the local gathering spot/watering hole and ask a few questions. Nothing ventured, nothing gained. 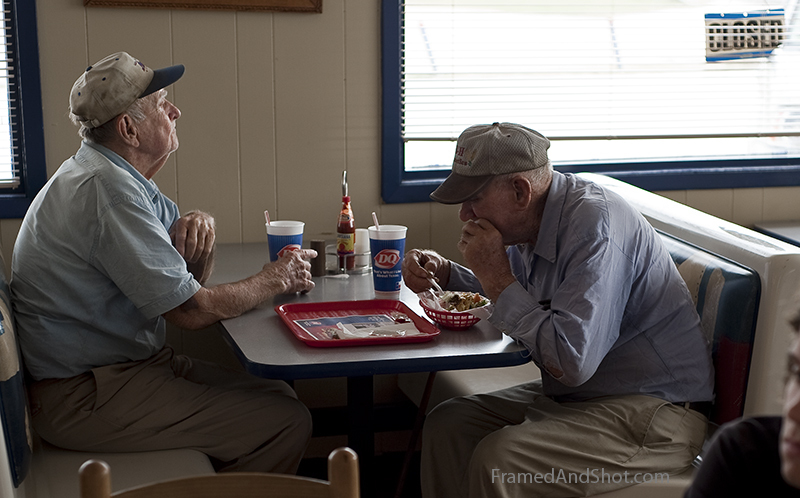 Here in Texas the Dairy Queen is a terrific source of information in that many old-timers congregate there to shoot the breeze and tell stories. They not only know local history. They lived it! See what appears to be a really old home that you’d like to detect? If you are dressed decently, stop and knock on the door. Introduce yourself, tell the owners about your pastime, and then “very politely” ask if you might be able to return sometime and detect their yard or area. Telling them you will return at a later date will give them time to consider your request, and tells them that you are prepared to be checked out. If you have a business card, all the better. Remember you only get one chance to make a good first impression, and if you don’t ask you will never know. I say this a lot, but if you cannot hunt a site now, asking and getting a “no” changes nothing. You couldn’t hunt it before, and you cannot hunt it now. Try to look at it that way, and you will see its simply status quo. Use Google to check out surrounding areas and communities. Type in the name of the town, and then add key words like park, school, grove, events, community center, carnival, football, baseball, etc. Find the closest scout camp. Boy Scout, Cub Scout, Girl Scout camps are all over, and finding them just might offer a great place to detect. I detected one particular scout camp back in New Jersey by giving detecting presentations or classes to the scouts in exchange for detecting the camp itself. It proved to be a very profitable site, and my wife Fay and I hunted it for sometime. It dated back to late 30’s. Join the local historical society. Most every town or county has one, and it can be a bottomless pit of information. Dan Hamilton (my old hunting buddy in New Jersey) and I joined a local historical society quite a few years ago, and were able to locate a very old picnic grove that had previously escaped our notice, even though it was less than five miles from our homes. It was mentioned in a meeting, and after asking a few questions, we located the site, were able to recover lots of old Indian Head cents, Barber and Liberty Seated coins, and I feel certain that it still holds a great many more. Advertise your pastime, your passion, to your friends, your co-workers, your relatives, your family. 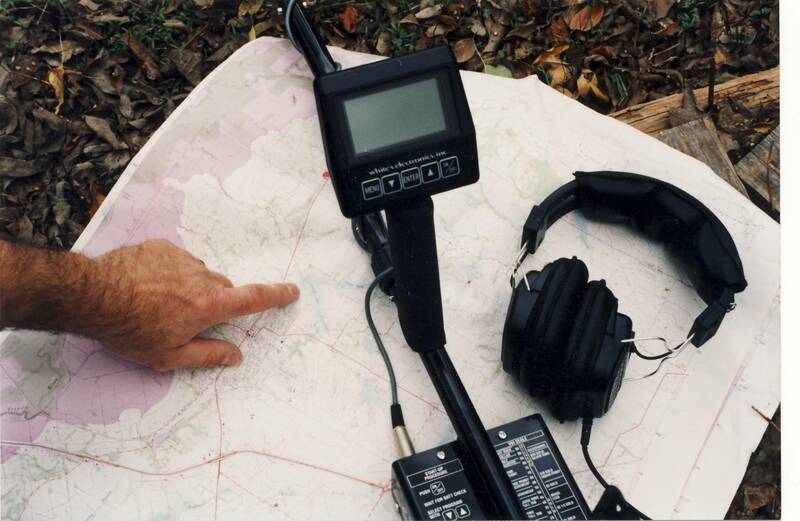 Ask each and everyone you might come into contact with for suggestions on where you might take your detector next. I know for certain that many are fascinated with my detecting, and often come back to me with a few ideas and places to check out. The more people you ask, the more your possibilities. Remember too to ask your friends and co-workers to ask “their friends and co-workers”. Corny? Maybe, but it has worked for me, and continues to work even now. Learn to recognize new and old ground. What does old ground look like? The grass will be mixed with weeds, and uneven terrain is the norm. Likewise bald areas also are an indication of heavy traffic. Don’t be turned off by the compacted soil. It’s exactly what you are looking for. The more use the merrier! In towns and cities, sidewalks offer a lot of clues as to the age of the area. Yes the homes will too, but buckling and cracked sidewalks also talk. Soil compaction over the years will cause them to rise and fall, and that area between the walk and the street can often be a bonanza. The reason? 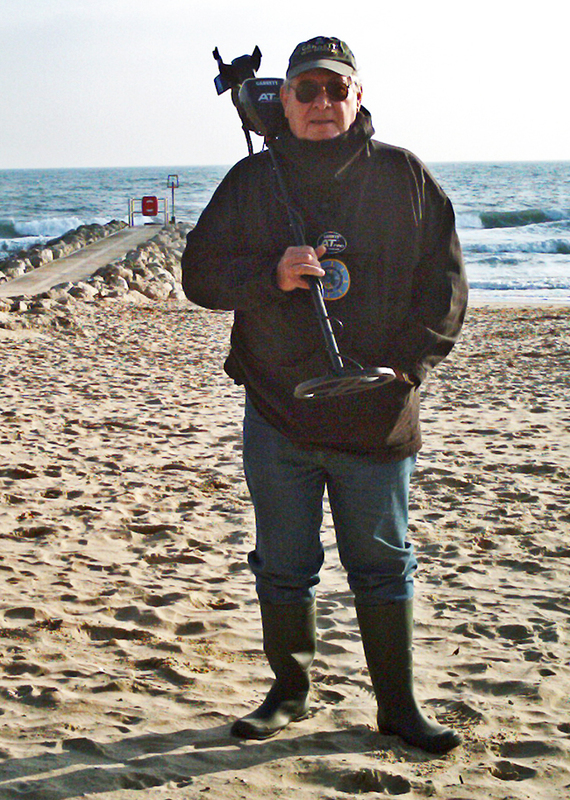 Most detectorists never bother to detect them. Many towns in the east hosted Chautauqua’s. Gatherings that often were religious in nature, and sometimes transient in that the sponsor would move to another town after a few days. In other words preachers or others with a sales pitch would arrive in the town, set up a tent, and advertise their presence. They usually attracted a good crowd because it was entertainment for the townsfolk. The travelers often brought musical groups, singers, etc.. These Chautaugua’s were usually held close to town, and generally in a large open area. Be sure to look into them. In the south they are referred to as revivals. Be sure to check out Arcadia Publishers. They publish photo/history books for many towns and cities, and are terrific for locating old sites. All you need to do is click on your state, and a listing of books available for your area will pop up. When you hunt any open area (athletic field, ballpark, school yard) don’t forget to delve into its fringes. By that I mean the area just might have been larger years ago, and over the years vegetation might have made it smaller. I once hunted a small town’s athletic field (was also used for carnivals), and took home hundreds of silver coins over the years. At one point I decided to wander a little into the bushes so to speak, and was amazed that I was still finding coins. It became a learning experience, and a good one in that I was able to use this theory at other sites. Visit the local schoolyard “only” to learn more about your detector, it’s capabilities, it’s nuances, its controls. It’s a great place to practice. Then spend hours on end finding an “old and potentially rewarding” site to put what your learned to work. I can guarantee you it’s a lot of fun and a lot more financially rewarding. If you want to find coins, find a “money site”, where coins were a necessity. Where they changed hands. Where they were needed to even be present. Yes you can find coins in the school yard but they are coins that were lost because of activity, motion, not of necessity. What is a “money site”? One example is the old athletic field! Here people had to reach into their pockets to enter, to eat and drink, and sometimes even to park. Those efforts repeated over and over again increase your odds a great deal. A few other money sites? Carnival grounds, fairgrounds, racetracks, rodeos, drive-in theaters and amusement parks. Any area that demanded you have money on you has to be one worth detecting. When you are at the library be sure look for Centennial or Bi-Centennial booklets. They were published to celebrate the occasion and were filled with remembrances by those in the community. Many had photos that would give me instant pangs of “where is this place”? Look for mentions of early town celebrations, holidays, carnivals, traveling circuses, reunions, chautauqua’s, disasters, bank robberies and even rumors. These booklets are also available through the local historical society. I can remember reading one such booklet about a town thirty miles away and noticed a photo of huge crowd at a football game in the early forties. I wasn’t familiar with the area in the photo but after asking a few old timers I discovered that the games at that time were actually played in a field about two miles out-of-town. It was still a field, but offered no indication that it was once used for football. Thanks to that photo, the old timers and a very kind farmer, I found quite a few silver coins and coppers. You can get up in the morning, get your detector out and head to the local schoolyard, knowing you will bring home quite a few clad coins. On the other hand, you can get up in the morning and take your detector to that unsearched area just outside of town, with the “potential” of a few very old, silver coins. Your choice!! Do you have neighbors? Might they know of older sites to detect? Do they have relatives? Might they also know of sites you can detect? How about the people you work with? The folks you go to church with? The people you bowl with, run with, hunt with, fish with, play ball with, volunteer with…..?? Get the hint? Bellewood Park was an amusement park in New Jersey at the turn of the century, attracting thousands. It lasted about twelve years. Back in the early 80’s it was not easily accessible, in that it was part of a quarry operation. I was fortunate enough to find the owners of the land, gain permission to hunt, and to bring home many, many old silver coins. Not sure what the area has to offer today, but the following information was not available to me back when I first hunted it. Bellewood Park. All I had to deal with was a mention in a centennial booklet. Given the nature of the internet today, you all have much more at your disposal. Keep records of your detecting trips. Record the date, name of site, time of day, weather and of course, what you found. Also notate anything worthy of remembering for any future trips. An example would be any adjustments you had to make to accommodate the ground conditions, what coil(s) worked best, what areas within the site still need to be searched and the name of landowner (if needed) with phone number. I personally use the i-detect Metal Detecting Journal (software, from White’s) to keep track of my efforts, but a notebook would also do the job. You will find yourself looking back at your notes often, especially when you have limited time and want to make the most of it. 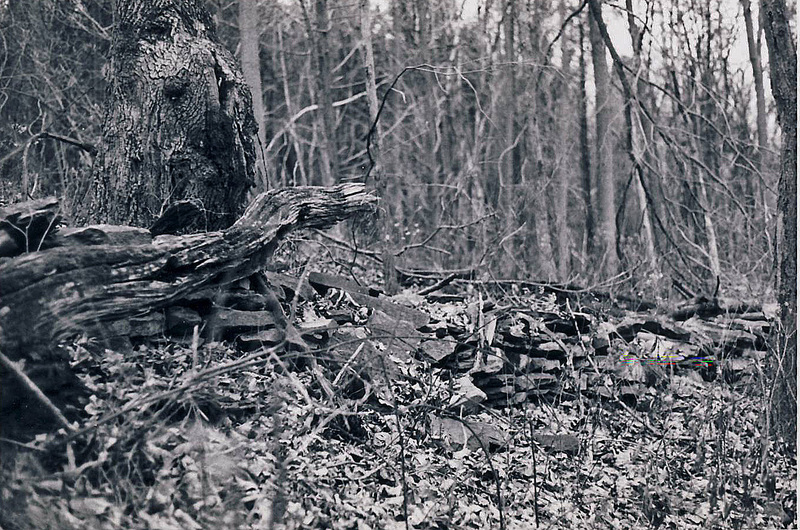 In the Northeast, early property boundary lines were defined by stone walls, and by that I mean “stacked” stone walls. Walls that were approximately three feet high, and that consisted of creek or local area stones, stacked one upon the other. These are still evident today, and offer the potential of some nice finds. The physical effort to construct these boundary markers was great, and the actual time spent building them, long. I have seen similar boundary markers here in Texas, but not as much as in the northeast. Hunters often have leased sites, and are extremely familiar with areas well off the main road. Ask them for help. They are not detectorists, and will gladly share their information. They quite often know of old home foundations, hunting cabins, rest stops, etc.. I am not a hunter myself, but have found a few productive sites simply asking them. Be on the lookout for street, sidewalk or road construction. The physical aspect of tearing up an area can unearth lots of treasures, not previously available before. You might have to return in the late afternoon or early evening, but make the effort. You will not know what it has to offer unless you do. If you live in a rural community be sure to read the different church histories. In the east many churches held what was called a harvest home supper. These were events where church attendees got together, shared a meal, and for that matter an entire day, filled with games, gossip and leisure. They were usually held nearby the church, in a wooded grove, and were the place to be seen. When I lived in New Jersey I had found three of these sites, and all offered up old silver, and a lot of ongoing anticipation. A lot of my early success in finding coins was the result of my becoming familiar with my community. To find old coins I knew I had to find those older areas where they were used with some regularity. I knew they existed, and I also knew I could find them. The solution was to locate people who were living back then, and who could provide me first hand information regarding them. That meant senior citizens (I am now one), and it meant asking direct questions. Where did you play ball when you were growing up? Where did you go to church? Where was the local carnival or circus held? Where did you go swimming in the summer? Seniors love to reminisce and actually enjoy sharing information of this sort. While I don’t do it anymore, I used to hand out business cards, and asked them to call me if they came up with any other places that might be fun to detect. I had a few do exactly that. Seniors are also very interested in your treasure hunting, and it helps to stay in touch, show them a few of your finds, and just perhaps offer them one or two neat ones. You also just might come up with a new detecting buddy! 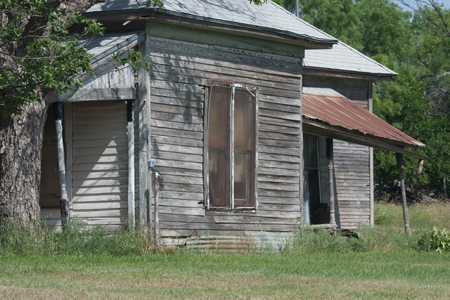 Old home near Bowie, Texas…. If you’ve read my Where to Find Treasure book you will be familiar with the All Important Big Four. If not, let me explain…. What’s the Big Four? Simply WHAT, WHEN, WHERE and FOR HOW LONG? What event or happening took place, when and where did it take place, and how long did it last? Knowing the answers to these questions is very important if you are to be successful in the field. Every site or area is automatically old, but if it was not used or inhabited over the years you will not find anything of value. Knowing what event, if any, took place there, how many people it attracted, and how long it lasted, will provide you with a starting point, and most likely success! For example, if your community has a yearly carnival, WHEN does it take place, WHERE does it take place, and for HOW MANY YEARS has it taken place? Or, if your high school fields a baseball team, WHEN did they start playing, WHERE did they play their games, and HOW LONG have they been playing there? If your town has a picnic grove, WHERE is it, WHEN was it first used, and is it STILL being used today? If your town or county once had a one room school, WHEN was it in used, WHERE was it located, and HOW LONG was it in use? The answers to the Big 4 will be the start of your treasure hunting efforts. The beginning of your quest for useful information. The beginning of what will hopefully be a financially rewarding conclusion, but whatever the outcome, it will also be the beginning of another facet of the treasure hunting pastime, and one which is just as interesting and sometimes more rewarding….historical research. You will not always find the answers you seek, but you will become the recipient of information that will make you more knowledgeable and better off for the effort. A FEW PLACES TO GET YOU STARTED…..
Schools, Parks, Churches, Athletic Fields. Carnival Sites, Circus Grounds, Picnic Groves. Homesites, Swimming Holes, Beaches, Scout Camps, Ghost Towns, Playgrounds, Camp Grounds, Rodeos, Roadside Rest Stops, Sidewalk Grassy Strips, Rural Mailboxes, Revival Meeting Areas, Amusement Parks, Rural Dance Areas, Reunion Sites, Fort Sites, Military Installations, Winter Sledding Areas, Lookout/Overlook Sites, Church Supper Groves, Fishing Holes, Resorts, Fishing/Hunting Camps, General Stores, Outhouse Areas, Battlesites (surrounding public areas), Bandshells, Old Courthouses, Racetracks, Rural Boundary Walls, College Campuses Under Seaside Boardwalks, Around Parking Meters, Flea Markets, Ski Slopes, Drive-In Theaters, Old Motels, Vacant Lots, Bus Stops, Old Taverns and Inns, Canal Towpaths, Construction Sites, Barns and other Outbuildings, Front Yards/Back Yards, Old Railroad Stations, Fence Rows, Hiking Trails, Trailer Parks, Near Historical Markers, Old Gas Stations, Lovers Lanes and old Town Squares. A few days ago I received my second copy of the newTREASURE HUNTER’S EXPRESS from Paul Tainter, and yes friends, it’s being published once again!! For those of you who have been detecting for any time you already know about the Treasure Hunter’s Express, and Paul. For those of you who don’t, be sure to read more about him. You can go to my website and under Latest News enter Paul Tainter in the search box. Paul and his wife Joan ran Research Unlimited for years, and are legends in my mind when it comes to treasure hunting, and have helped thousands become successful over the years. Their Treasure Expo conventions were must attends for many years, and I consider myself privileged to be asked to speak at a couple of them. Have a feeling that while we are all out there pushing touchpads, up & down-arrows, increasing this, decreasing that, changing audio, tone, sensitivity, accept, reject, changing frequencies, changing coils, some guy is out there with a turn-on and go machine finding it all before we even get there. And……all because he’s spent his time researching! I know almost all of you use Google to research and find new places to detect. It is without a doubt the best search engine out there. I am also guessing you pretty much do what I do and that is type in the name of my town, county or state and then add keywords like schools, churches, parks, history, etc.. Anyway let me suggest a few more words you might try. I can’t promise they will work for you but they have provided me with a lot of leads to work on. If and when you give them a try, have a thesaurus or synonym finder on hand and see what substitutes you might also throw in the mix. When I open the trunk of my vehicle and fellow detectors see a lot of fishing equipment along with my two detectors, they wonder whats going on. Likewise, when my fishing pals see detectors in my car they give me the strange eye because none of my circle of close fishing pals own a detector. When you consider the objective, in both cases we are doing the same thing, only with a different target. We hold a detector or fishing rod in one hand, we either cast towards a likely place that will harbor a trout, or we sweep our detector hoping to find some silver or valuables. If we get a tug at the end of the line, or a strong beep from the detector, it creates the same reaction to the participant, we are looking for a good keeper. Treasure hunters will drive about looking for obvious places to hunt, or clues to a road that will lead to a hot spot. With me, I find new places to detect while I am fishing. These are places unseen from the highways. Over the years I have found countless old foundations, stone walls, abandoned orchards and abandoned dwellings. I eventually hunted every one of them. All were along the banks of the stream unseen from the busy highways.